Peanut Butter: A Boon Or Bane? There’s something immensely satisfying about a PB & J. There’s nothing gourmet about it, but we absolutely love it. The combination of the two spreads and bread works like magic. Be it layered in a sandwich or spooned straight out of the jar, peanut butter tastes great. Maybe, a little to great. So what’s the deal with peanut butter? Is it healthy? Is it fattening? Does it cause cholesterol problems? Is almond butter a better option? Just like pretty much everything in the fitness world, there are conflicting views. There are multiple schools of thought. One day it’s good to eat carbs, one day it’s bad. Some say supplements are unhealthy; some believe they’re vital to performance. It’s very hard to pin things down as right or wrong. But here’s my take. The main reason peanut butter has garnered so much hate over the years is it’s high calorie and high fat content. Two tablespoons would pack anywhere between 180-200 calories (depending upon the brand). If you’re worried about your weight, remember that in order to lose weight you’ve got to create a calorific deficit. Eat less than you burn. Let’s say you’ve allotted yourself 2000 calories. You can easily fit in a serving of nut butter. In fact, fats offer more satiety than proteins and carbohydrates; since they take the longest to digest. So a spoonful of this goodness might just keep you a little more satisfied, for a longer period and keep you from eating mindlessly. Given that Peanut Butter is a balanced food by itself, housing all the 3 macronutrients, we might tend to go overboard. The protein is complete, meaning it contains all the essential amino acids.We may just look star-struck at “protein” and forget about everything else. Using nut butters as a protein source may not be the wisest thing to do, since one tablespoon may give you 4 g of Protein but also 8 g of fat. Fats are vital to our survival, but they’re super easy to over consume. There’s plenty of ways to get in high quality protein without overdosing on fat. Ask yourself what you’re looking for? If it’s fat, great. Peanut Butter makes for a better fat than protein source. Say fat, feel a shock down your spine. The word has gained a terrible reputation over the years. Eat fat, get fat right? Contrary to popular belief, we aren’t always what we eat. The problem with fat lies with eating too much of the bad stuff, too little of the good stuff. Saturated Fat, was initially deemed as the devil. However, research has now proven that it’s actually beneficial in the synthesis of hormones and even in the absorption of fat-soluble vitamins. Moderate intake will not, for most people, be detrimental to health, but on the flipside may actually be beneficial. If you were familiar with the composition of peanut oil, you’d know that it’s rich in healthy mono-unsaturated and poly-unsaturated fatty acids. These have been known to lower LDL or the bad cholesterol. So you’d think that they’d aid in preventing the clogging of arteries, which usually end in heart disease. A number of studies conducted on rats, rabbits and primates, suggested that peanut oil actually caused atherosclerosis, the clogging of arteries. In fact it was so potent, that till date peanut oil is fed to these animals to study the effects on their arteries. Peanut oil contains lectin, a large protein molecule. As with most large molecules, one would assume that it’s broken down by the digestive enzymes in our bodies. However, unfortunately lectins are resistant to these enzymes. They end up binding with the cells of the bodies, including the ones lining the cell arteries and sugar receptors, eventually causing atherosclerosis. Is almond butter a better option? 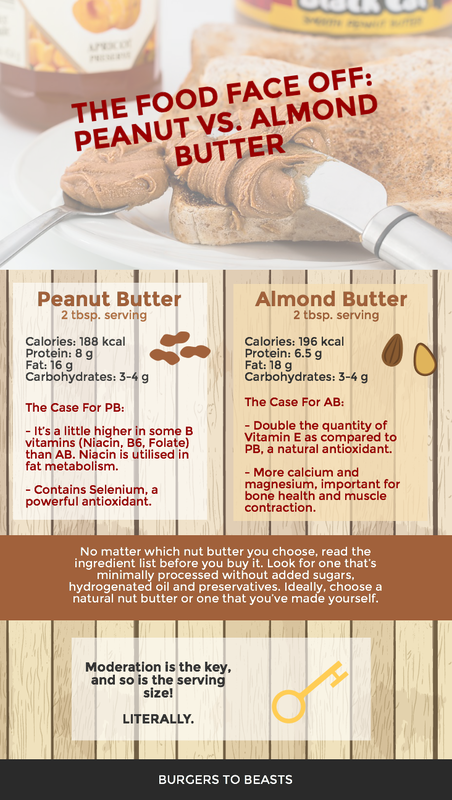 Over the past few years almond butter seems to have emerged as the healthier alternative to peanut butter. Truth be told, they have a very similar nutrition profile; about 98 kcal per tablespoon, 3 g Carbohydrates, 8 g Fat and 4 g Protein. The fat is predominantly unsaturated or the good kind. They start differing on a microscopic level as far as micronutrients are concerned. Almond butter contains double the quantity of Vitamin E, a natural antioxidant and immunity booster as compared to PB. It also contains more calcium and magnesium, minerals important for bone health, blood pressure control and muscle contraction. Peanut Butter can’t be dismissed just yet. It’s a little higher in some B vitamins and Selenium than almond butter. Selenium is a powerful antioxidant, and Niacin—plays a major role in energy production and fat metabolism in the body. You’d think that peanut butter is solely crushed peanuts. But reality is a different ball game. Food manufacturers want to portray the utmost desirability of the product. They want it to have a longer shelf life. They want you coming back for more. No one is going to go back for a food item that tastes like feet. So what do they do? They’ll add in the worst of ingredients. Sugar, hydrogenated oil, salt and other trans fats. If that weren’t enough, you’ll also get flavored peanut butter like white chocolate or cinnamon. There’s something about the combination of fat, salt, protein, and texture of peanut butter that encourages overeating. Worst of all the almost drug-like-addictive sugar. The “I need more” feeling far surpasses the “I’ve had enough notion”. There’s a reason you can never stop at “just one”. Long story short you’re not doomed to live a peanut butter-less life. Just make it at home, it’s easier than you think. You’ll also be in control of the portions and quality of the ingredients. Life is short, and you’ve got to do things that make you happy. So if a spoonful of Peanut butter does just that, go ahead. If you can stop right there, great. But if you find yourself polishing of a jar in a single sitting, you’re digging your own grave. It’s very calorie dense, and most people tend to underestimate exactly how much 2 tablespoons is. As a reference, this is 2 tablespoons next to a car key. Quite literally, moderation is the key.